This high performance serum helps to sooth sensitive, irritated skin by strengthening the skin's natural defenses. 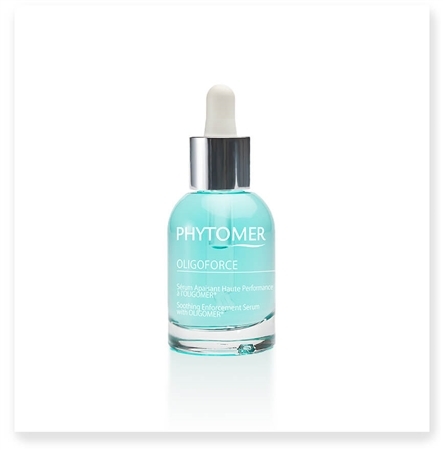 Treat irritated, inflamed or otherwise sensitive skin with OLIGOFORCE Soothing Enforcement Serum, a micro-emulsion formulated to sooth and strengthen skin’s natural defenses. This marine-infused product is wonderful to use post chemical peel treatments, on irritated acne or as an every day product booster. Boost the efficiency of products (by three times) when using under moisturizers and masks.With a wonderful relaxing scent, this soothing treatment is non-comedogenic and gives skin an immediate feeling of well-being. Apply 4-6 drops before moisturizers and masks, carefully avoiding eye contour area. PHYCOSACCHARIDE® (Laminaria digitata): anti-irritant, anti-inflammatory, regenerates damaged cells, stabilizes the epidermal immune cells. DRI'LINE®: Purified extract from yeast membrane (biotechnology): anti-irritant, anti-inflammatory, regenerates damaged cells, stabilizes the epidermal immune cells. Use under moisturizers and masks to boost product efficiency up to 3 times.